According to www.nbcnews.com Americans spend more than $1.4 billion on over-the-counter (OTC) whitening products annually. That wasn't hard to believe because I know myself and everyone around strive to have white teeth. I always get compliments on the whiteness of my teeth. Although I appreciate the compliments, when I look in the mirror i don't see super white teeth, I just see non-yellow teeth. So with that said I researched a cost effective way to whiten my teeth rather than just going to the dentist for the annual clean. I had two options - the chemical way or the natural way. First let's start with the "Chemically Infused Way"
Chemical Infused Teeth Whitening - "Crest White Strips"
Let me start by saying when I say chemically infused I am referring to products that are consist of alot of chemicals that have been altered out of their natural state. Of course everyone knows about the Crest White Strips that actually bleach your teeth. 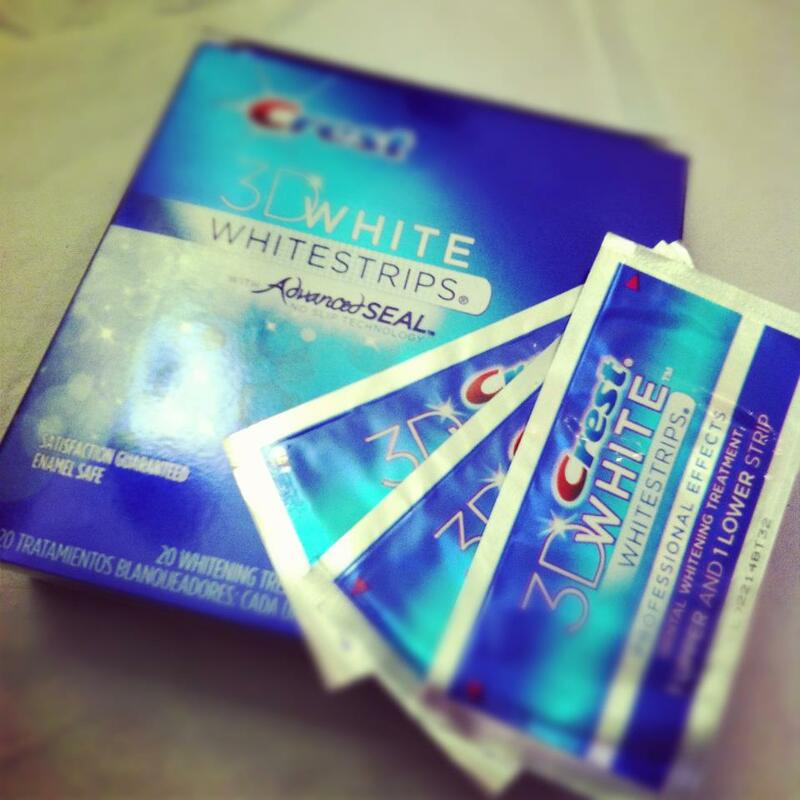 The one I researched is the Crest 3D White Whitestrips With Advanced Seal Professional Effects Whitening Kit, 20ct. This product is said to whiten your teeth on a professional level and you should begin to see results after 3 days and these results that can last up to 12 months. Natural Teeth Whitening - "Baking Soda & Peroxide Paste"
After alot of research I found that although naturally whitening my teeth would not give me the quickest results it was surpassingly the most cost effective. Usually when we think about natural remedies and living the organic life, we automatically assume $$$$! Well not in this case. I went with the "Baking Soda & Peroxide Paste". Its cheap (cost me all of $4) and its easy to prepare! In this paste of-course the main components are Hydrogen Peroxide & Baking Soda. Hydrogen Peroxide is made of Hydrogen & Peroxide! DUH! Well the Oxygen causes the product to have oxidizing abilities which naturally bleach items when applied. When peroxide is applied to teeth, it bleaches the enamel. Another benefit of the peroxide is that it kills the bacteria in your teeth and mouth which in turn can promote good smelling breathe. If you look at the ingredients in over the counter whiteners, Hydrogen Peroxide is one of the first things listed. Baking Soda is an all around natural cleaner. It acts as an abrasive agent in which it helps remove debris and surface stains on your teeth. 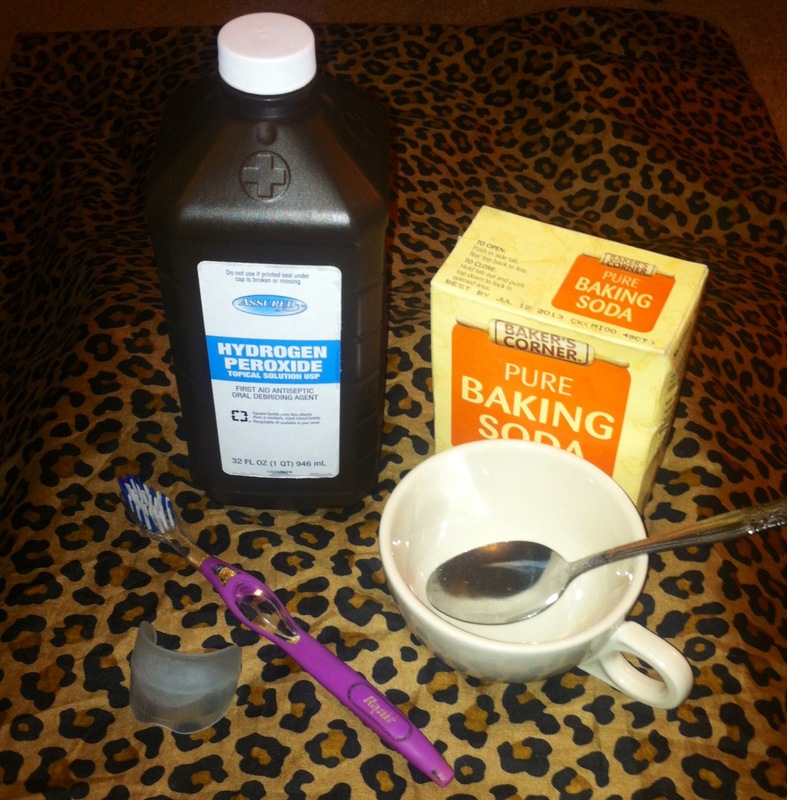 With the mixture of Hydrogen Peroxide & Baking Soda you can create a very effective paste to brush your teeth with. I started this a month ago and I already see results. Results may vary and since this is a natural way the results will take a little longer to appear than a comestic or over the counter bleaching formula. In a small bowl mix the Peroxide & Baking Soda together until it forms a paste. Add more Peroxide if the paste is two thick or add more baking powder if the paste is runny. You want it to be consistency that can easily be swirled onto your toothbrush. Once the paste is made you are ready to apply it to your teeth. Depending on what I previously ate will depend on which way I apply it. The first option which is the most effective is to run your toothbrush under water, then swirl or dip your tooth brush in the paste making sure you coat all the bristles with the paste. Then you will brush as you normally would in circles or up and down for 4-5 mins. Rinse with cold water and your done! The second option I only do when I have some time on my hands and if I have exposed my teeth to a bunch of gunk. I use a teeth tray or a mold and I fill it with the paste. I then place the tray in my mouth and bit down. I let the tray remain in my mouth for about 10-15 mins. This will allow the paste to distribute through my mouth. Be careful not to let the paste get on your gums as this could cause burning. After 10-15 mins, I will remove the tray and rinse out with cold water. I told you it was easy and affordable! You really cant beat that!!! I typically brush with this paste at night. Sometimes I will skip one night but no more than that. I encourage anyone who desires to have whiter teeth to try to natural way out. If it doesn't work for you then go back to your OTC Bleachers but at least you can do it knowing you didn't spend a lot of time and money . For quicker results you can add lemon in the mixture as lemon is a natural bleacher. Just be careful that you don't over bleach! There is a such thing! Remember there are many other ways to achieve white teeth but this is just the way that works best for me. If you have one that works better, please share!